Politicians and officials begin to react after terror attack in Jerusalem. Blame focused on Aharonovich, Danino - and political apathy. MKs and public officials are beginning to react to Wednesday night's terror attack in Jerusalem, after an Arab from the Silwan/Shiloach neighborhood associated with Hamas attempted to run over pedestrians. Nine are injured, three critically. Blame is being put, as has throughout the past several months, on Internal Security Minister Yitzhak Aharonovich and the Israel Police, specifically Commissioner Yohanan Danino. 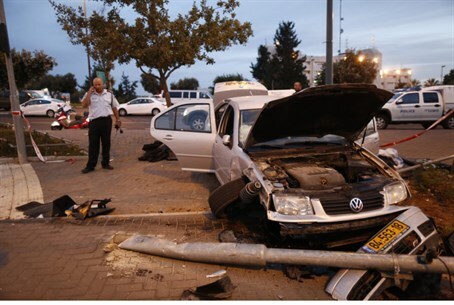 "All indications are that this was a terror rampage," Aharonovich stated, according to Yediot Aharonot. "In the past the driver was in jail; the police and the Shin Bet continue to investigate." "This is not simply an attack," he added. "We must assess the situation throughout the city, including the riots. I spoke to the Prime Minister and asked to reinforce the border patrol forces." "We must restore calm to the city." But MKs and other officials have become fed up with both Danino and Aharonovich, saying that not enough has been done to quell the waves of terror. "We must restore peace to Jerusalem - as I said for months, the situation in Jerusalem is intolerable and we must be acting unequivocally against the violence taking place in the city," Jerusalem's mayor, Nir Barkat stated. Progress with Danino and Aharonovich had stalled so much that he turned directly to Prime Minister Binyamin Netanyahu to stop the "silent intifada." "Now it is clearer than ever that the police must be put into Arab neighborhoods where there are disturbances, that checkpoints must be established, and that a significant presence must be felt," Barkat added. "At my request, the Prime Minister has instructed to reinforce the police to be able to operate and carry out operations against rioting, including the addition of personnel and special units, using new technology, and increasing intelligence," he continued. "I'll continue to be vigilant and will not rest until security returns to Jerusalem." "The attack which killed a three-month-old baby was not the work of the Devil," Economics Minister and Jewish Home Chairman Naftali Bennett fired. "The Israel Police and Internal Security Ministry must relate to every rock-throwing incident as a terror attack, to every arsonist of a light rail station as a terrorist - and to every enemy that wants to kill an infant as an immediate threat." "Arab terrorists are lifting their heads in Jerusalem, both as a result of the mistaken politics of the Internal Security Ministry and of the Israel Police," MK Moti Yogev (Jewish Home) stated Wednesday evening. "Politics which [allow Arabs to] throw rocks at Jews leads directly to Molotov cocktail attacks and shooting fireworks." "Politics which do nothing to stop these attacks encourages terrorism and leads to drive-by attacks and shootings," he continued. "The Internal Security Minister and the Police Commissioner to allow the State to broaden the control given to police forces in the field, to send out the best police commanders possible [to fight terrorism] in East Jerusalem and to return security to the entire capital." Housing Minister Uri Ariel (Jewish Home) agreed. "The violence in Jerusalem has reached its climax," Ariel fired. "The reality in the last two months - of constant violence by minority groups - must stop." "This begins with throwing rocks and Molotov cocktails and has continued to deteriorate," he continued. "Today, to our sorrow, blood was spilled as a result." "I demand from the Prime Minister and the Internal Security Minister to work voraciously against those who harm Israeli citizens," he added. "And to concentrate Israeli police forces in Jerusalem to crack down as hard as humanly possible on the deteriorating security in our capital city." MK Yoni Chetboun (Jewish Home) called to restore safety and deterrence. "It cannot be that Jerusalem is now an unsafe place for Jews to live," Chetboun fired. "The unbelievable ease by which a terrorist carried out an attack in Jerusalem cannot be overlooked, it cannot pass in silence." "We must restore our deterrence, the sooner the better," he continued. "This is not just a matter of sovereignty [over Jerusalem], this is a matter of life and death." MK Nissan Smoliansky (Jewish Home) agreed. "It's time to end the 'silent intifada' and restore quiet to the streets of Jerusalem," Smoliansky said. "Once again, this is proof that every concession made in Jerusalem - including on the Temple Mount - extends our political weakness and increases terrorism. The time has come for the Israeli government to give clear instructions to security forces and the means to act against rioters." Former Deputy Defense Minister and MK Danny Danon (Likud) has also called for drastic action. "The blood of the inhabitants of Jerusalem has become hefker (cheap)," Danon roared. "The time has come to take extreme action against rioters." "Arabs in East Jerusalem, which is led by radicals, must know that these acts will engender a 'zero tolerance' response by the Israeli government," he added. "The police must expand their campaign against incitement in the Arab public. It is inconceivable that the residents of our capital city are afraid to leave their homes due to drive-bys and rock throwing."